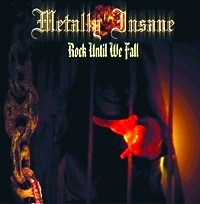 The “Rock Until We Fall” single was originally released somewhere around 2004, I cannot remember the format though. CRYSTAL TEARS (a notable Power/Heavy/Speed Metal band hailing from Greece) mainman is Chrisafis Tantanozis behind this effort, a collaboration of many many Metal musicians from Greece honouring their love for traditional Metal music with a song that has nearly everything: passion, melodies, a great chorus, a rolling pace, nice leads and – overall – zealous maniacal vocals. The 7” single consists of the same songs in both sides. Still, it should be noted that the sound is different, the original take being handled by Chrisafis Tantanozis himself while a second mix sees legendary producer Chris Tsangarides (JUDAS PRIEST, THIN LIZZY, ANVIL, Gary Moore) donating his valuable experience to the project. It’s obvious the first take is more appealing for fans of the ‘underground’ Heavy Metal scene while the second take will please metallers with more ‘polished’ ears. “Rock Until We Fall” is the kind of songs that sum it up to what classic Metal music means to its fans. If you’re a vinyl lover (it’s a limited hand-numbered edition of 525 copies in orange/black splatter vinyl) then METALLY INSANE quite a good purchase. And – why not – shouldn’t we listen to something more by this project in the near future?